After last seasons Cis League cup run ended up with an anti climactic trip to Hampden to face Celtic in the final, Dunfermline again start the road back to the National Stadium on Tuesday night at lower league opposition. This year, it is Ayr United who were drawn out of the hat as the home team and Robert Connor`s team will be hopeful of an upset against a Dunfermline side yet to win this season. There are echos of last seasons trip to Gretna, as the then in form second division team were many pundit`s favourites to knock a SPL team out of the cup at the first time of asking. Mark Burchill`s first ever goal for Dunfermline was all that split the teams on a night when Bryn Halliwell kept out all that Gretna could throw at him. In a tight second division, Ayr United currently sit on four points from their three games played so far. An opening day 3-1 win away to Stirling got their season off to a flyer, with the veteran Jerome Veraille getting two of their goals. Ayr`s first round CIS cup tie saw them welcome Berwick Rangers to Somerset Park, and a straight forward enough 2-0 win put them through to face Dunfermline in this the second round. Cowdenbeath brought Ayr back to to earth however, when they took the same route as Dunfermline will take, hopefully a similar Fife scoreline will result at the Blue Brazil spanked Ayr 4-0 just 10 days ago! 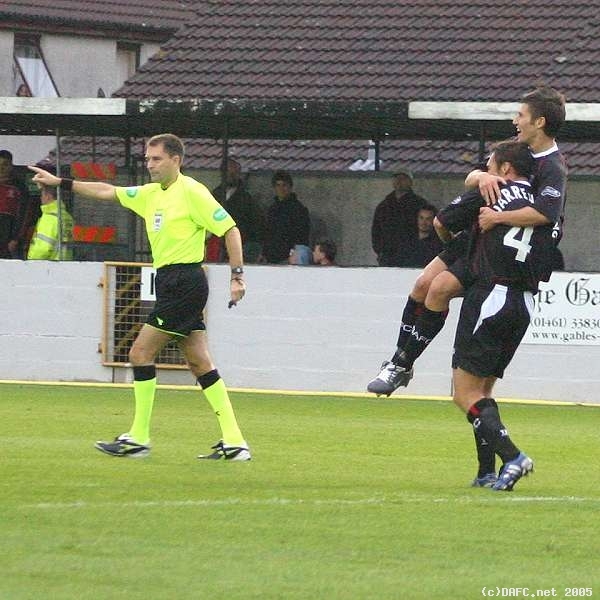 Burchill`s first goal for the Pars was on the 23rd August 05! Ayr`s cup pedigree was given a boost a week ago, when recently relegated Livingston were surprisingly knocked out of the League Challenge Cup 2-1, again at Somerset Park. Veraille grabbed his third goal of the season during the game, and he will certainly be the main opposition threat on Tuesday night. Saturday past saw Ayr grab a point away to Morton, in another match that will no doubt have been watched by someone in Dunfermline`s camp. Veraille is clearly their main threat up front, though local lad Gareth Wardlaw will be known to some. DAFC.net contributor JohnnyW is his younger brother and will hopefully not have any split loyalties towards his sibling on Tuesday evening. Veteran keeper Mark McGeown is Ayr`s number one, the former Airdrie player being first choice in amongst a very young Ayr team consisting mainly of shrewd picks from the Junior Leagues. Former Aberdeen and Scotland midfielder, Robert Connor, is the part time manager of Ayr combining his time with the running of a drainage company. A preview could not have been written without mentioning the utter shambles that was the match in the third round of the Scottish Cup back in January 2002. Jimmy Calderwood`s team travelled with big expectations of a straight forward enough victory, however they were dealt a lesson on a wet and windy miserable Ayr day. Gus McPherson got in on the act, with a bizarre (yet clinical) own goal which the Ayr fans took particular pleasure in watching in front of their end. The former Kilmarnock legend took pelters before, and certainly after, his bizarre shot at goal that sailed past Scott Y Thomson. 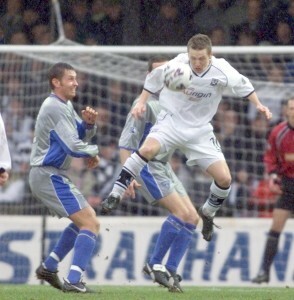 John Robertson got Ayr`s third after 58 minutes and Dunfermline`s top flight side were simply down and out. A team that consisted of players such as Skerla, Thomson, Nicholson, Ferguson, Mason, Petrie, Crawford and Bullen were simply dumped on their collective backsides.